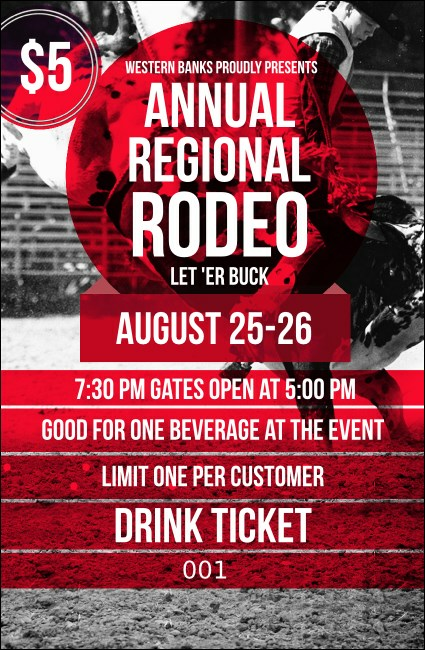 Spur your guests toward the bar and watch them buck with excitement when you sell Modern Rodeo Drink Tickets at your event. These rugged, contemporary tickets feature a black, white and red background with a photorealistic picture of a rider hanging onto a wild, bucking bull. They also include numbering for enhanced security. TicketRiver.com.au helps you find the right ticket for your stock.